Virtual reality (VR) technology is expected to play an increasingly important role in laparoscopic surgical training in the future. Haptic feedback in VR training remains a debated topic amongst researchers and practitioners. This study was designed to test the hypothesis that haptics would improve the control of force application in a virtual pick-and-place task, especially when the task index of difficulty (ID) is high. Using a laparoscopic tool connected to a haptic device, subjects transported a ball into a box of varying sizes (W) at different distances (A) in a virtual environment. Three indices of difficulty (ID) were used: ID1 (easy), ID2 (moderate), and ID3 (difficult). ID was determined using Fitts’ Law (log2 (2A/W)). Ten naive subjects participated in a 2-haptics x 3-ID repeated measures design experiment, performing three trials per condition. Dependent measures were time, maximum and minimum applied force, and smoothness of tool motion (force and smoothness were tracked in three dimensions). Data analysis results based on analysis of variance and t-tests showed that 1) significantly lower forces were applied when performing tasks with haptic feedback than without (p < 0.001); 2) significantly lower forces were applied in the ID1 condition than in the ID3 condition in the y and z dimensions (p=0.025, p < 0.001, respectively); 3) maximum force application in the z dimension was significantly lower with haptic feedback, the difference being more pronounced in the easy task than in the other more difficult tasks (p = 0.015); 4) tool motion was significantly smoother in the easy task (ID1) than in the difficult task (ID3) (p < 0.001). This was true for all three dimensions, with or without haptics. Time to task completion was not significantly different, except in the transport phase of the difficult task (ID3). These results indicate that subjects were better able to control force application with haptics. The similarity in the time measure among task conditions suggests a strategy favoring speed over force control in the absence of haptic feedback. Therefore, it can be concluded that haptic feedback is important in improving the accuracy of force application while maintaining the speed (or efficiency) of task performance. 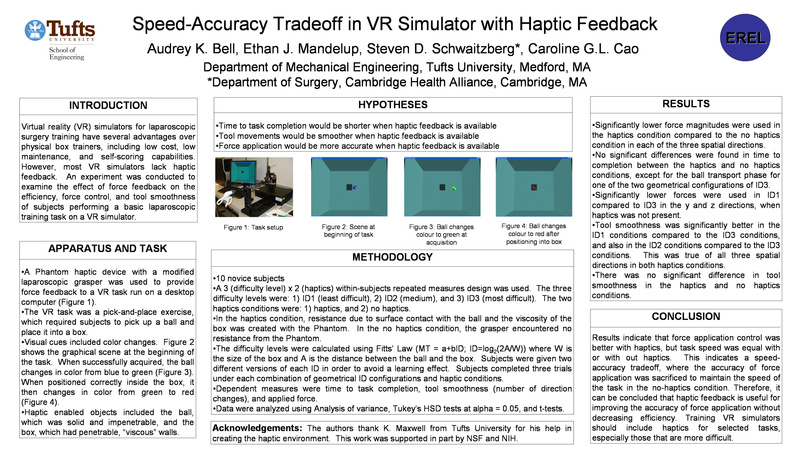 The benefit of haptic feedback in VR training simulators for surgical skill acquisition remains to be investigated.